Assalaam-O-Alaikum Dear Reader's. Today's Our Topic Is "How To Remove Blogger Navbar". Hope You Will Like... May Be Everyone Hate This Bar That Appears On Every Blog. I Too Hate. 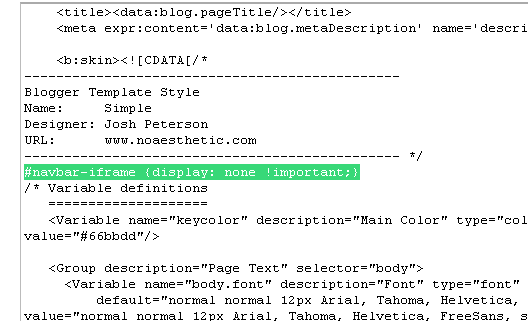 This Navbar Appears, If You Use Blogger Templates Created By Blogger. If You Use Another Templates. Then This Bar Will Not Appear. Blogger Navbar Is About Between 45-55 Pixles In Height And Stretches Across The Complete Broadness Of The Web Browser Window. Now Start Our Today's Work. 1. Go To Your Blog's Dashboard. 2. Click On Design And Then Click On Edit Html Sub Tab.